This allows you to add an additional business, account or transaction. EasyBooks keeps all accounts, transactions, reports and other information for each business separate from all other businesses. For further information, please refer to "Adding a Business". You can use this option to choose the business you want to work on. You can also use the control at the top of the sidebar, which also shows the selected business. 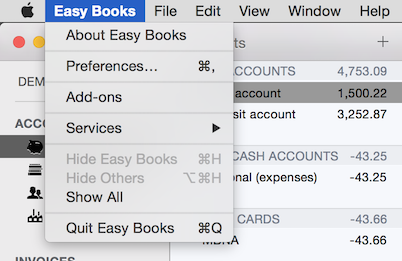 You can use this option to import transactions from a CSV file into EasyBooks. For further information, please refer to "Importing Data". You can use this option to output data from EasyBooks. When a report is selected in the main window, this option can be used to email or save the report. It is also possible to output transactions as they appear on screen when viewing a list of transactions. You can use these options to back up and restore business data. Producing backups is essential to avoid possible loss of data in the unlikely event of, for example, a hardware fault. For further information, please refer to "Backing up or Restoring Data".